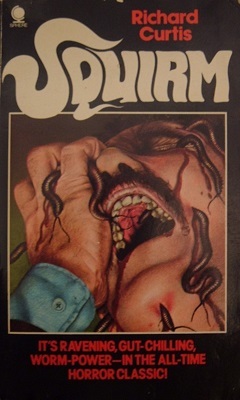 The book Squirm is the novelization of the 1976 movie of the same name. The script for the film was written by Jeff Lieberman, but Richard Curtis wrote the novel. The story is set in a rural community called Fly Creek and the book begins by introducing a young boy named Roger Grimes, who lives with his father on the local worm farm. Roger has an intense dislike of worms, but his father is obsessed with them and spends most of his evenings in his workshop, studying the worms and performing experiments on their long fleshy bodies. This means that Roger, whose mother is dead, spends a lot of time on his own. Late one night, however, Roger, who is feeling a little lonely, decides to take a walk down to the workshop. He finds his father passing electricity through the tanks that house the worms. Mr Grimes has noticed the electricity brings the worms up to the top and he hopes to find a way of using this discovery to make it easier to harvest worms. Unfortunately, the experiment has unforeseen consequences and father and son both get a shock when one of the juiced up worms starts burrowing into Roger’s thumb. The story then jumps forward by fifteen years and finds Roger, fully grown and working alongside his father on the farm. Roger is infatuated with his neighbor, Geri Sanders, but she has no interest in him. Geri only has eyes for a city boy she met at an antiques fair. His name is Mick Gordon and when Geri is introduced to the story she is busy preparing for Mick’s visit, while Roger is outside picking up sticks from the ground and ogling her through the window. Mick is travelling to Fly Creek by bus, but there was a bad storm the night before, it has brought down a tree, and it’s blocking the road, so the bus cannot get through. What kind of man would let a little thing like a fallen tree stand in the path of true love? Not Mick, that’s for sure. He decides to walk the rest of the way, a task that is made all the more difficult because much of the land is flooded. When Mick arrives at Fly Creek, he finds the town has no electricity because the high voltage tower that provides it was blown down during the storm and thousands of volts of electricity are going straight into the ground. Can you see where this story is going? I’m guessing you can. 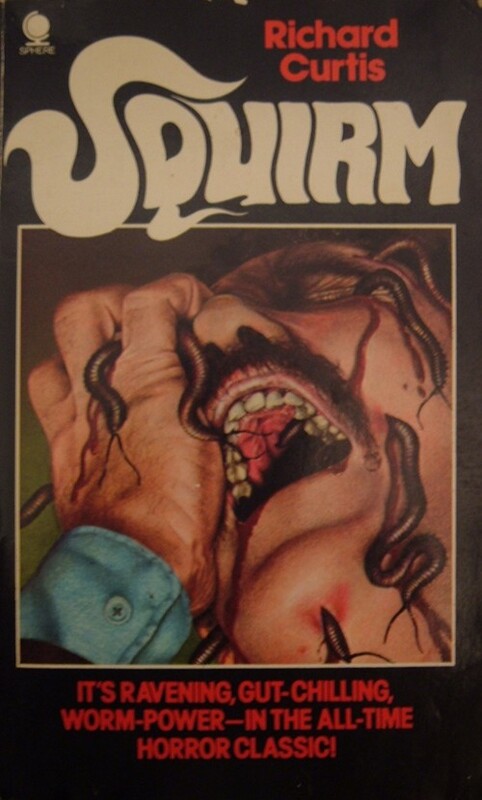 Squirm is not one of the best horror stories that I’ve ever read, but it is a reasonably enjoyable book and the idea of worms burrowing into living flesh is a suitably nasty subject for a horror novel. However, the beginning of the book is a little deceptive. It makes it appear that Roger is going to be the main character. He’s not. The story centers around Geri and Mick. Roger remains an important character, but it’s pretty hard to know what to make of him. When Roger is first introduced it is easy to feel sympathetic towards him. As the story unfolds, he seems more and more oddball, until he is almost the bad guy of the book. But there are contributing factors that are out his control. The kind that have teeth and wriggle and Roger is not always responsible for his behaviour. Roger may have gone worm daft, but the local sheriff has no excuse for his actions. His attitude stinks and he has it in for Mick right from their very first meeting. The sheriff is more annoying than anything else, but I doubt too many readers will feel much sympathy for him when he has to face the writhing hoards of man-eating worms. If you’ve read and enjoyed books like Spiders, Devil’s Coach Horse, or Worms there is a pretty good chance you will enjoy Squirm as well and it’s a slightly better read than Worms. How does the book compare to a Stephen King, or James Herbert book? It doesn’t. It’s not on the same level at all, but if you fancy something a little different it’s worth a try and, at only 157 pages long, it would not be too hard to read Squirm in a single sitting; and it could be worth buying a copy just for the grotesque cover.